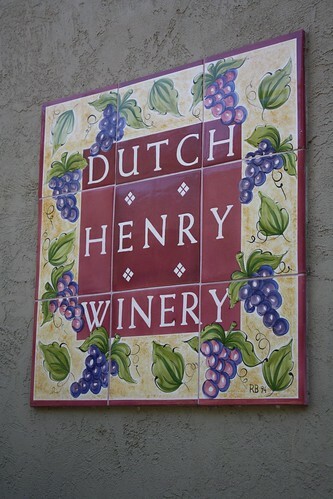 2005 Dutch Henry Winery Merlot | ...so I remember it tomorrow. Life’s a little different now. When we lived in CA, we didn’t have any kids…which meant we could come and go in the Valley as we pleased. Now we have kids. Between my job and our love of wine, we frequent Napa & SF as a vacation destination. Therefore, every time I get on a plane, it happens to be going to ‘Californ’ (as my 3 year old pronounces it). Since she keeps asking me if she could go to ‘Californ’ one day…we decided to take her on our anniversary trip to SF & Napa this year. What a great idea. There’s nothing like seeing places you’ve been 100 times like seeing it through a childs’ eyes for the first time. 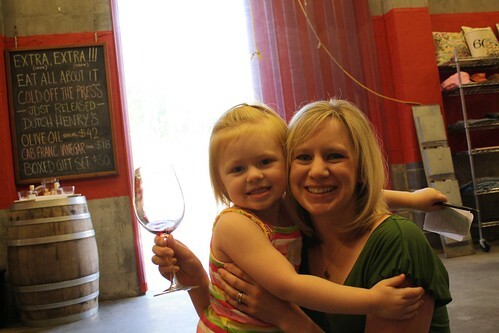 We now had to seek out some ‘kid friendly wineries’ if we wanted to take Addy anywhere – and one that came *highly* recommended is Dutch Henry Winery in Calistoga. 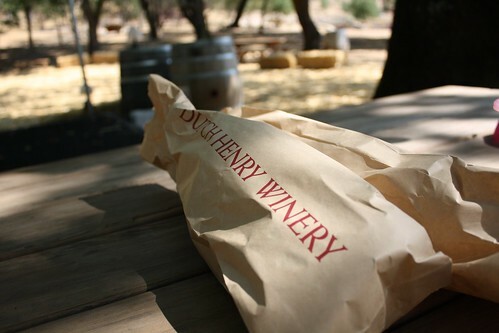 Dutch Henry Winery is a little further up the Silverado Trail in Calistoga, which is never a bad thing. I prefer the Silverado Trail for everything from getting up/down the valley to the ‘type’ of wineries to visit – as it’s much less touristy than Hiway 29. When we went in late September, it was about 100 degrees out, but luckily the tasting room was nice and cool as it is essentially setup inside a warehouse. They did a real nice job making it into a ‘tasting room’ though still – from the decor to the layout. It had a cool and welcoming feel to it. I forget the gentleman’s name who poured for us and walked us thru the wines Dutch Henry offers, but he was very nice with a good, dry sense of humor – so that wasn’t lost on us. He warmed right up to Addison, and made sure that she was welcome and comfortable. They also never complained when she ate about a DOZEN small slices of bread meant to be sampled with their olive oil. It was much appreciated as it kept her happy and full (ie quiet). The full array of wines was impressive – each very different from the prior – and all were slightly ‘different’ than the run of the mill Cabernet or Merlot you’ll taste in a tasting room line up. While I won’t compare the wines, the style of having a refreshingly different ‘take’ on each varietal reminds me of Artesa, who does the same thing. Its hard to explain, but essentially after a while the nuances from winery to winery are rather small. Certain places, and Dutch Henry is one of them, add a little ‘twist’ to the wines they produce which make them THOROUGHLY enjoyable. Two wines that stood out to us the most was the Rose (Cab Franc, I believe) and the ’05 Napa Merlot. The Rose we drank within a week of getting home – as we had a few SUPER hot days here in MA – and it was perfect. Tart, lucious, not over the top, refreshing yet with good body. As for the Merlot – I can’t find the winemaker’s tasting notes online, but I believe that it’s a Merlot-driven Bordeaux blend rather than a pure Merlot – and it’s friggin’ awesome. I actually wish that I would have let it sit a little longer in the basement to settle down (or that I just had some more of it), as it never quit. While we were there, it was the standout from the lineup. The other wines – Syrah, Cabs, etc – were all great, but this one was balanced with great fruit structure and power. I loved it. Tonight, the wine was a little different at first than what I remembered in the tasting room, but they ALWAYS are. Mid-bottle though, it was back to what I remembered – which was friggin’ awesome. It opened with a very interesting nose, consisting of deeeeep dark chocolate and (of all things) a savoryness that resembled something between BBQ and beef and broccolli. I know that sounds crazy, but it wasn’t a bad thing at all…it was just a very deep and savory scent. After 10-15 minutes, the wine began to loosen up, and a powerful chocolate covered cherry flavor emerged. The tannins began to emerge and become slowly but surely more refined and really counter-balanced the tartness of the cherry fruit. The next ‘phase’ was a woodsy, cedary, sage, and spiciness that appeared. Again, this added further complexity and depth to the wine. Did I mention that it had a nice, loooong, finish as well? The bottle ended (yes, we drank the whole bottle) with a beautiful ‘cola’ aspect to it, which really rounded everything out and made this wine super enjoyable all around. We drank this with grilled skin-on, bone-in chicken breast, gnocchi w/ brown butter sage, and roasted broccolli w/ parm cheese – oh, and it was friggin’ awesome! Great job guys – all around. Dutch Henry was super welcoming and accommodating when we were there, and the wines surpass all of the ‘mass market’ stuff out there. There is an attention to detail and a style to their wines that will make us keep coming back. Thanks for the kind words. Look forward to seeing you and Addy again.